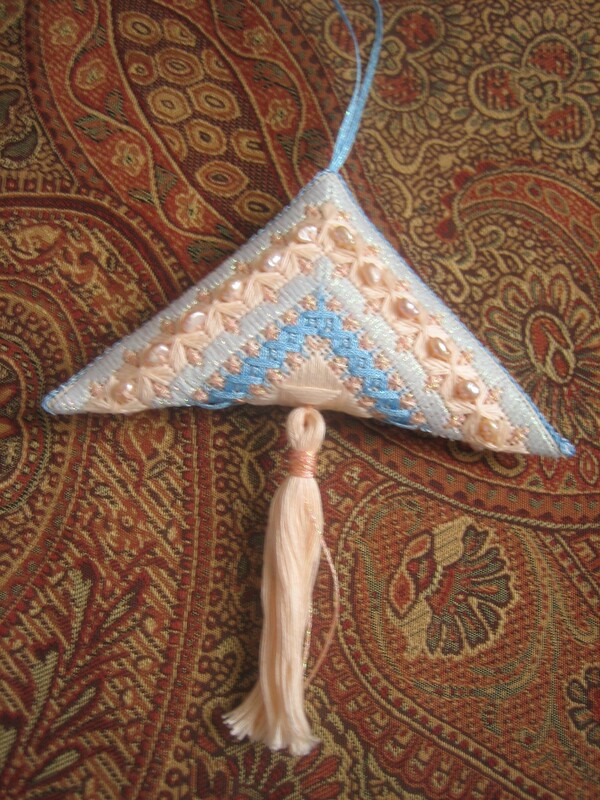 One of the things I’m doing this Summer is preparing for needlework activities in the Fall. Most of what I’m producing comes under the heading of “show and tell,” but some of it is paid work and some of it is prep work for classes. The three major ones are a canvaswork folding ort box and a cross-stitched etui which I’d like to show off at a guild meeting in October and the models for a piece (Tonie Evans’ Madrigal) I’m teaching to another guild chapter in October. The first two I just need to stitch on diligently and I’ll be ready with them. The models are a different matter. 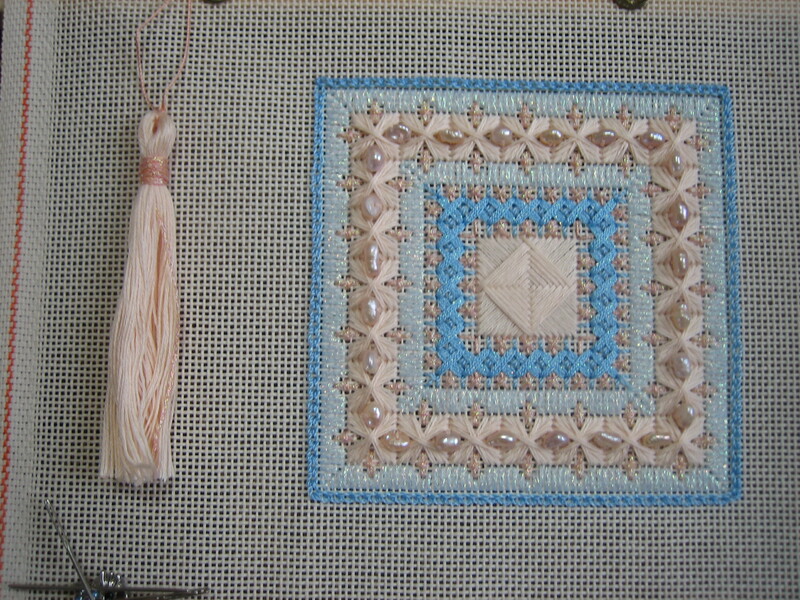 I have the finished model — the “here’s what this will look like” piece — all done, but I need to run up the demonstration pieces: a canvas with each of the required stitches started (so I can demonstrate each one) and another canvas with all of the stitching done (so I can demonstrate the suggested finishing technique). I made teaching notes, both for prework and classwork, while I was working on the finished model, so I can even make up handouts to go with the pattern. I didn’t design this pattern, but I’m going to be awfully familiar with it by this Fall! I’ve been slugging away at some finishing jobs — some for pay, some for love — and have gotten several pieces out the door in the last two weeks. Three of them are ornaments that someone else is paying me to finish, and I don’t think I can post a photo of them, but two of them are for me and mine. Pictures to follow, but in brief I have finished a cross-stitched bookmark for my daughter (her stitches, my construction) and my first pair of socks! They aren’t perfect, but they’re comfortable (I know this b/c I wore them yesterday when we were blessed with cooler weather), look cool with jeans, and obligingly hide their faults in the toes of my shoes! No resting on my laurels — I’ll be back in the studio this afternoon, working on the fourth ornament of a group of five — but I was encouraged by this level of progress and hope you will be, too. While catching up with laundry from our long weekend, I made sure I did a little work each day on something in the studio. Since I managed to get 3/4s through knitting a pair of socks this Spring, that looked like a good place to start — not too far to go until the end. Since I really am doing only a little each day on this (since cleaning up the studio seems necessary both for finding the next big project and for space in which to work on it! ), it’ll will take me a week or so to finish, but when I’m done, I’ll have a nice new pair of handknit socks — not a bad reward at all. As I have taken this Summer off from regular Guild and stitch group meetings (the last is next Wednesday — hurray! ), I’m trying to finish as much as possible out of my studio. More productivity, less gas to put into the tank. I brought two projects (both cross-stitch) with me to the lake this weekend, not knowing what the light would be like. It was good enough to work on an antique-like design done in black on “swamp” dyed linen from Picture This Plus. I’m about 1/3 done with the main stitching and I still have to choose which raspberry/pink thread to use for the accent stitches. Stay tuned for progress updates and pictures.